You might want to check and see if you can downgrade it to the Dividend card. The opportunity to downgrade to the Dividend will likely end very soon if it hasn’t already, and it is a useful account for maintaining account age and a little bit of spending. $6000 per year to be precise. The Dividend card was a 5% cashback card designed to compete with the Chase Freedom card and, while it doesn’t do a very good job of that, the Dividend card is good for an easy $300 each year and has no annual fee. However, the Dividend product is being replaced by the Double Cash card and all of the Dividend applications I could find no longer work. The double cash card only beats out the Dividend card if you will put more than $15,000 on it in a year. That’s $15,000 that could go toward meeting other signup bonuses worth far more than $300. I had no problem earlier this year with downgrading an AA Gold card (originally opened in 2013) to the Dividend. Category bonuses on the Dividend card for the past few years have included drug stores during the first quarter and Amazon during the fourth quarter. There are other categories too if that matters. We just make a few drugstore purchases early in the year, pick up the $300 (the annual limit on cashback earned) and then leave the card alone for most of the rest of the year. The best gift card MS categories for 2015 appear to be Q2 and Q4. Ideally you could downgrade one old Hilton, American Airlines or ThankYou card to the Dividend card and another to the Double Cash card which could definitely come in handy if other opportunities dry up for you. Or just wait on the Double Cash – reports are trickling in of targeted $200 offers for the double cash card, which is half of what it would take to make the Double Cash offer competitive. What do you think? Is there a Citi no-annual-fee card worth downgrading to instead of one of these? Can anyone report success or failure trying to downgrade to the Dividend since the Double Cash product was announced? I have a Dividend (downgraded from Hilton HHonors many moons ago; it takes 45 days to make the transition). Back in January, I maxed out the Dividend at my local Consumer Value Stores before the ice cream all melted. It was sweet. What you’re implying, and people may not know, is that one can use the Dividend for $6K in 5% category spending in a single quarter, rather than being spaced out at $1.5K per quarter with the Freedom and Discover IT. Yeah, thanks for clarifying that. We found it too cold for ice cream in January, even in South Texas. So we did the same at our local Medicine and Miles store in February. harvson3, I didn’t know this about the $6K in one 5% category; if I had known that, I would have gone gangbusters last Q4 since I had just converted 2 cards in Q3. I’ll probably just wait for Q4 again this year. Thanks. That’s exactly why I PCd mine over to a Dividend before the end of the year and bought $6000 worth of “stuff” at Best Buy. I’ve got a worthless Citi Diamond card that I need to convert to something. Maybe this is it. Q1 sounds good. Saw your post and decided to give it a try. I also was given a useless Diamond Preferred converted by Citi automatically recently from an equally useless Platinum Select. Called in and can report success. 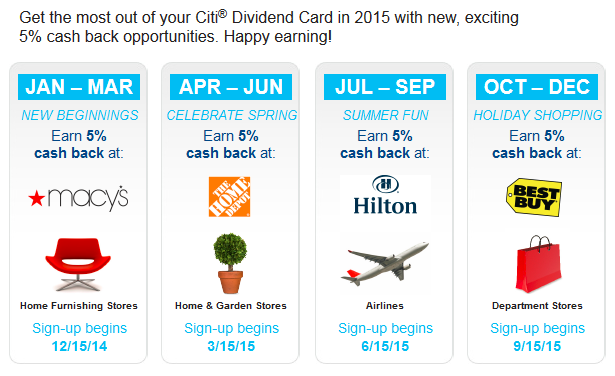 I will be getting a Citi Dividend World in the mail in a couple of weeks! I had a crazy low rate before and confirmed it will carry over. So no hard pull, same rate and AAoA maintained. The Citi Dividend lives! That’s good to hear. I think I’ll be doing that. I’ve had the DP for a long time so it’s got a long history with it and an OK CL, so I don’t want to just close it. Thanks. Will look into this esp. if no hard pull. I was on vacation and took a break from all things MS. Gotta get back to it! Just did it about 5 minutes ago, and still valid. The agent immediately asked about the Double Cash, but I declined. Thanks Kenny for the post! Does anyone know if it’s possible to have two citi double cash cards? Last time I called citi wasn’t moving credit limits. Maybe this could be a way to get a higher limit on another product?